When you select 'Download', your project first needs to be rendered, which means that it needs to be prepared and processed on our servers in the format and quality you need. SD or Standard Definition generates a video of 480 pixels high and, in 16:9 format, 854 pixels wide. This choice delivers the smallest video file size. 'Full HD" is a High Definition resolution of 1080 pixels high x 1920 pixels wide. This is the highest quality possible but also delivers the biggest video file size. subscriptions both include all quality options. 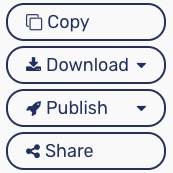 After your video has been rendered, the video will become available in the dropdown list of the Download button. When you publish your project to the Moovly Gallery, Vimeo or YouTube, it also first needs to be rendered before the actual publishing can take place. 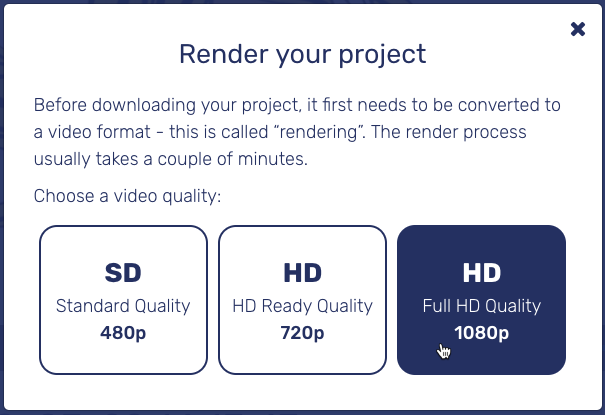 Please note that render time depends on the chosen video quality, the complexity and length of your video and on the current render queue on Moovly's servers. Short SD-quality videos can be rendered in minutes, but long videos in Full HD can take up to an hour and more to be rendered. How to download and use a video presentation?